The pleasure of entertainingâ€¦. Taking inspiration from the fiery and aromatic cuisine of Central and South America, MAMBO is big flavors, samba~salsa music, mojito~caipirinhas and a wide array of tasty tapas. The restaurantâ€™s exposed brick walls and bold vibrant colors imbue the main dining area with a truly intimate atmosphere, making it perfect for romantic rendezvous or corporate cocktail receptions. The private room on the lower level is perfect for celebrations, company meetings or product launches. And the newly renovated Mambo rooftop is a destination for those seeking a sound escape at sunset. MAMBO Nuevo Latino brings dynamic nightlife and a vibrant mix of cultures where youâ€™ll wine; dine on a unique mix of Latin influences. 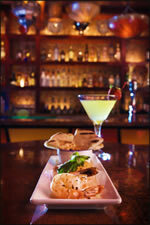 Mambo Restaurant carries you through a memorable dining experience, as you live, love and dance with a Latin flair.